There’s something big missing in the current NASCAR racing circuit. It’s the look and feel of real stock production cars. Before the last 20 years NASCAR race cars used body panels that were actually shaped and sized like it’s production counterpart which anyone could purchase brand new off the dealer lot. For instance back in the 1980s, when Chevrolet used Monte Carlos for NASCAR racing, anyone could purchase a Monte Carlo SS from a Chevrolet dealership that looked just like the car that raced around the track. This proved the old slogan of "race on Sunday, sell on Monday". For instance, if Ford had a good year on the race track back in the 1960s with its Ford Galaxie, then Galaxie sales were also good. People wanted to buy what won on the track. It was a great formula for both NASCAR and automakers. Unfortunately in recent years NASCAR has gone way off track and is now a big business with a whole slew of clone race cars that are driven by heavily promoted personalities. It’s now about the drivers and no attention is paid to the cars. Even during the golden days of NASCAR, big names such as Richard Petty had to share the limelight with their winning cars – as an example Petty’s blue #43 (1971) Plymouth Roadrunner was revered by fans. The reason for the change, is due to the current crop of NASCAR race cars having an identical rounded aerodynamic shape. The only thing used to differentiate between these race cars are taillights decals, headlight decals, and a pseudo front grille – all which are there to aid in making them look like the production cars each NASCAR racing car is supposed to represent. This is the main complaint of many fans especially since the 2007 debut of the NASCAR "Car of Tomorrow" – the Generation 5 NASCAR race car which all teams were mandated to use. This had teams affixing decals of the names of cars these race cars were supposed to represent, in big letters. For instance if a race car was supposed to represent a Dodge Avenger – "AVENGER" call outs would litter the exterior. The idea behind the "Car of Tomorrow" was to make NASCAR race cars less expensive, safer, and all uniform. It was indeed all of these things but it destroyed what was left of the individual identities of NASCAR race cars. In essence it turned NASCAR into an IROC race where everyone had the same exact car but in NASCAR’s case the cars were supposed to represent different make and models. Back in the golden era of NASCAR during the 1960s and 1970s, the most inept fan could tell the difference between the cars fielded by the different American automobile manufacturers. These automakers were forced to use a stock production car shell and if they wanted an aerodynamic advantage such as a spoiler or fastback roofline, it had to be offered to general public through their dealership network. For instance the 1969 Dodge Daytona, 1970 Plymouth Superbird, and 1969 Ford Talladega were some examples of low volume production cars that were produced to give aerodynamic advantage on the NASCAR race track. Some of the most widely respected performance cars had their roots in NASCAR. Even during the 1980s, some of the best and most interesting performance cars were born out of the necessity of competing in NASCAR. Some of these cars were the 1983-1988 Monte Carlo SS, 1986-1988 Monte Carlo SS Aerocoupe, 1986 Pontiac 2+2, and 1983-1987 Ford Thunderbird. And the legendary 1982 and 1984-1987 Buick Grand National would never have seen production if it was not for NASCAR racing – the Grand National was named after the NASCAR Grand National series. In other words, NASCAR fueled the production of unique and legendary performance cars. What does NASCAR add to the performance or uniqueness of production cars now? Nothing. To NASCAR’s credit it understands there’s a problem – falling attendance at multiple big race tracks has NASCAR concerned. Its remedy is the new Generation 6 car platform which is setup to use body panels that are shaped to look a little bit more like the production automobiles they are supposed to represent. As an example the new Generation 6 Ford Fusion NASCAR race car actually looks like a Ford Fusion (however it still has headlight and taillight decals). Though this is a step in the right direction, NASCAR doesn’t go far enough. NASCAR should enact four new edicts to remedy the identity problem of its race cars, if it’s serious about fixing the problem. The first edict enacted should be to make mandatory that a race car use the same identical drivetrain configuration as the production car it’s based on. For instance a front-wheel drive car like the Ford Fusion, must also be front-wheel drive powered on any NASCAR racing series. A production rear-wheel drive car must be rear-wheel drive on any NASCAR series. Same would be true for an all-wheel drive production car – it must use an all-wheel drive drivetrain setup. This would push automakers to convert the production cars they showcase in any NASCAR series to rear-wheel drive. Front-wheel drive could never be competitive in NASCAR, the cars so equipped would be too front heavy and would be easily out-handled at high speeds by rear-wheel drive cars. All-wheel drive adds too much weight to a race car and it wouldn’t be as effective at high speeds as rear-wheel drive. There’s a reason why NASCAR and the major racing circuits, have only rear-wheel drive race cars. The second mandate NASCAR should implement, is that only 2-door cars can qualify as NASCAR race cars. This would eliminate the current practice of allowing an automaker to showcase a 2-door NASCAR race car version of a exclusively 4-door production car. This all started back in the late-1990s when Ford used a 2-door Taurus race car when they only offered a 4-door Taurus to the buying public. This edict would force automakers to offer sporty 2-door coupes of any car it races in any NASCAR series. With this rule in place, if Ford wants to use a Ford Fusion race car it would have to produce a 2-door Fusion for the buying public. Could you imagine being able to go into your local Ford dealership and purchase a rear-wheel drive 2-door Fusion? See how this improves the Ford lineup with the addition of just one sporty rear-wheel drive 2-door coupe. Imagine the same thing being true for Chevrolet, Dodge, Toyota, and other automakers competing in NASCAR. It would effectively add a lot of fun rear-wheel 2-door cars to the marketplace. And once a production car is rear-wheel drive it’s not difficult adding a V8 to the option list which raises the fun factor considerably. The third mandate which should be implemented by NASCAR, is that all race cars should use body panels with same exact exterior body dimensions as the production cars they are based on. The race cars should have the same lengths and wheelbases of their production car counterparts (it’s understandable that the race car height will be slightly lower and width will be slightly wider since these are race cars). Even with the new Generation 6 NASCAR race cars, they look more like their production counterparts than the "Car of Tomorrow" but they still have vastly different dimensions. For instance the Ford Fusion Generation 6 race car has a much lower frontal area of the hood to improve aerodynamics when compared to the production 2013 Ford Fusion. And from the rear the NASCAR Fusion looks like an entirely different car than the production car. 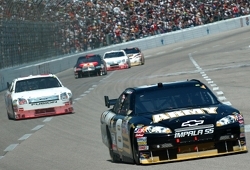 NASCAR was originally setup to race stock spec cars around the oval track. NASCAR can go back to its roots by making sure the cars racing around the oval use the same exact shape and dimensions of the production cars they represent. And this also would include spoilers. If a spoiler is used on the race car, the same spoiler must be available on the production car. This is how it used to be with NASCAR, and this is how it should be again. Of course back during the golden era, there were some rule benders like Smokey Yunick who made slight modifications to panel dimensions to improve aerodynamics but it was so slight the average human eye had difficulty detecting the changes. The forth mandate should be that any engine used in any NASCAR series must be used in a production vehicle. The NASCAR version of an engine, just like the old days would be more powerful than the production version yet it would use the same displacement and architecture of the production engine it is based on. Back in the golden era of NASCAR, if Ford, Dodge, or any other automaker at the time wanted to use a particular motor they were mandated to offer it in a production car. If it had not been for that mandate there would never have been a production Mopar 426 CID HEMI V8, Ford Boss 429, etc. 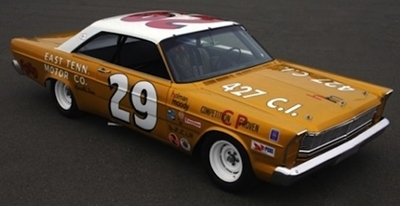 NASCAR also pushed Chevrolet and Ford to release their versions of the 427 CID V8. All these engines were sold to the buying public in order to allow their use in NASCAR. Because of this mandate, a lot of buyers were able to purchase cars with these legendary motors. In other words NASCAR racing put a lot of powerful engines in street cars back in the day. Unfortunately NASCAR doesn’t do the same in these times. Spectators and fans during the golden era of NASCAR could buy at a new car dealership a body style and a motor they saw at the track, hence they felt more connected with the NASCAR race cars they saw at the track. This was what NASCAR was all about. Even with the new Generation 6 race cars, if there aren’t big callouts with a car model name, most fans will still have to squint their eyes and look for headlight and taillight stickers and a pseudo grille and maybe they can figure out what make and model the race car is supposed to be. NASCAR will probably not mandate any of the four suggestions outlined in this article, but if they did implement them on all NASCAR series races across the board or in a new sub-series or circuit, it would give fans a renewed connection to the new cars found on the car dealership lots. A race spectator could once again point to a NASCAR race car and proudly proclaim "that’s the car I drive" and "my car has the same engine". Without this connection, NASCAR is just like the Formula 1 racing circuit, where there’s no connection between the race cars and the spectators. And the renewal of this connection would have the added benefit of spawning the growth of new fun rear-wheel drive performance oriented 2-door production cars. It seems like a no brainer to me. Unfortunately the continual push for absolute parity and the unneeded standardization across the board of every part of the race car, will probably dictate the future of NASCAR instead. However continued falling attendance numbers may force NASCAR to go back to its roots after-all. « The Manual Transmission – on the Road to Extinction?